We arrive at Khong Chiam by early afternoon on Day 2. This is a popular tourist destination for Thai folks but mainly unknown to foreigners...it is at least 700 kilometres from Bangkok...quite remote...but services several attractive National Parks and is a great place to sit and eat/drink whilst observing Laos on the other side of the Mekong river. In the second picture you can see Tim and Ray are waiting for their coffees to be served, and the top picture shows what they would see if they lifted their eyes off Tim's smartphone...that is the mighty Mekong river, and the communist Country of Laos is on the far bank. Ray: Makes the world a better place, Larry. Ray: The people in this region are fabulous too, Elizabeth. Ray: i am guessing most people relate Mekong River to Vietnam War, Chris...most likely because of the river's starring role in the movie masterpiece "Apocalypse Now". Ray: Good, and inexpensive, coffee, Bill, and the view was great! You boys- what are you like! Like Chris, the Mekong river also makes me think of the Vietnam War (not I've not seen the film that you mentioned). Ray: The Mekong river dominates the geography in this region, Alan and, just here, it is the border between Laos and Thailand. The movie I mentioned is basically the "Heart of Darkness" story of Joseph Conrad brought forward into the 1970's and replanted in SE Asia...I recommend it to you. Dommage de ne pas profiter de ce spectacle , mais peut être le connaisse t- il déjà ..
Ray: Tim me donnait une petite leçon de lecture de cartes, Claudine ... nous planifions les activités de l'après-midi. Quand Tim a réalisé que je ne faisais pas attention, il a mis le smartphone et nous avons apprécié la vue. I didn’t know Laos was still commie Ray, I thought that stuff was old hat. I like the barrier made from a found item. Ray: Laos is some kind of communist place that is run by a despotic General who is very rich but has such a low profile that few people know his name, Chad. I have been in Laos a few times and found that the soldiers and police also maintain a very low profile...the Laos people, though, seem open and friendly, and their Quality of Life is slowly improving. Ray: This coffee shop is on the broad footpath directly overlooking the river, Philine...and we have the place almost entirely to ourselves. You are making me yearn a vacation, Ray. Ray: Stay with us, Mary...there is much still to come and I think you will enjoy the relaxed pace. 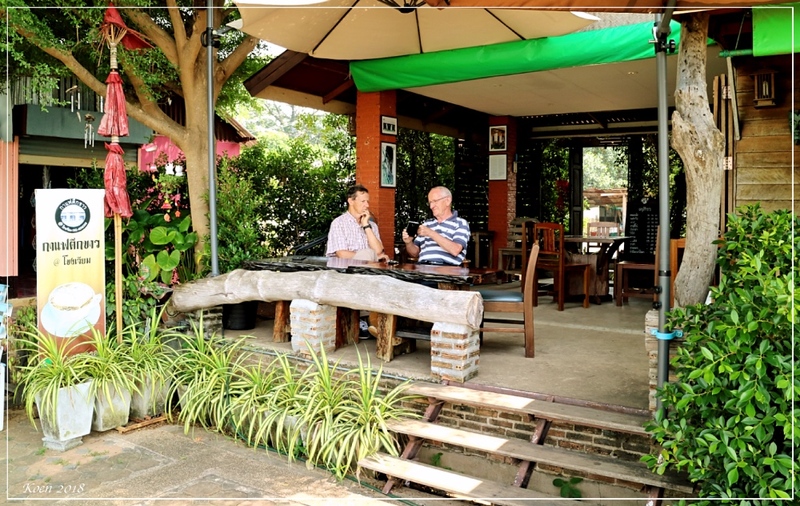 Well the top is certainly a very nice landscape to enjoy and the coffee shop looks very inviting. Chads comment and your reply are very informative, I didn't know any of that. Ray: Laos is a most interesting place, Brian. It is of similar area to UK, but has only 6 million people, most of whom are engaged in subsistence farming...similar sized Vietnam, to the East of Laos , has 100 million people. Ray: Some lovely places in this region, Tom...more coming up.